Mezzanotte Night Club/Lounge (Syracuse, NY 2005-2007-Bryan Matthew Boutwell-interior designer/curator/lighting designer/artist) Mezzanotte stands for midnight in Italian. This photo is of a piece of art that I made that resembled the idea of midnight. It’s the concept of the moon and it rising into the night skies at midnight. I wanted to create a piece of art that lit up a dark corner in the nightclub. 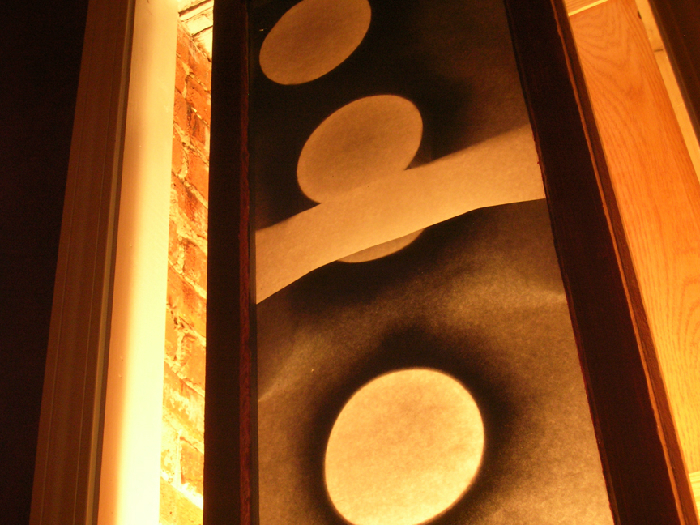 I used an old window shutter and attached white paper to the back of it and spray painted the circular design as to represent the moon. I hung the piece and lit it from behind. It accomplished two things. It captured the idea of the nightclub’s theme and it also served as ambiance that matched the rest of the design and feeling of the nightclub. I believe that the best art at times is the simplest art. When someone tries to overcomplicate lighting or ambiance it often tends to become obvious and obnoxious. In my experience, when something is simple it has a better chance at being more graceful and elegant.